Here we have an 8 x 10 laminated photograph that is suitable for framing. 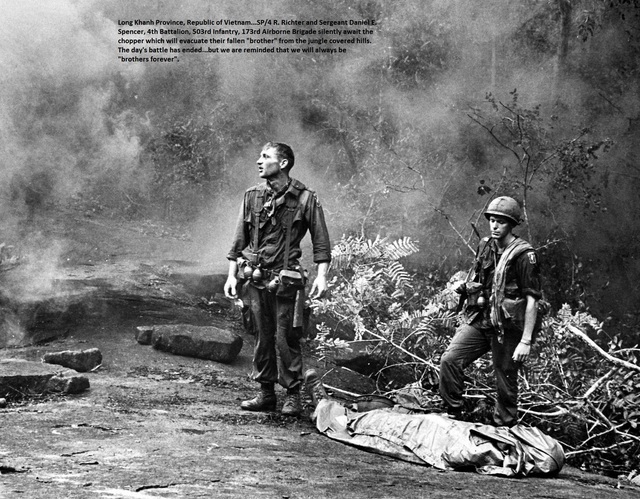 It reads, Long Khanh Province, Republic of Vietnam...SP/4 R. Richter and Sergeant Daniel E. Spencer, 4th Battalion, 503rd Infantry, 173rd Airborne Brigade silently await the chopper which will evacuate their fallen "brother" from the jungle covered hills. The day's battle has ended...but we are reminded that we will always be "brothers forever". NOTE...LZNAM security mark is not on the photo you will receive.